Catherine de' Medici (Italian: Caterina de' Medici pronounced [kateˈriːna de ˈmɛːditʃi]; French: Catherine de Médicis pronounced: [katʁin də medisis], 13 April 1519 – 5 January 1589), daughter of Lorenzo II de' Medici and of Madeleine de La Tour d'Auvergne, was an Italian noblewoman who was Queen of France from 1547 until 1559, as the wife of King Henry II. As the mother of three sons who became kings of France during her lifetime, she had extensive, if at times varying, influence in the political life of France. For a time, she ruled France as its regent. 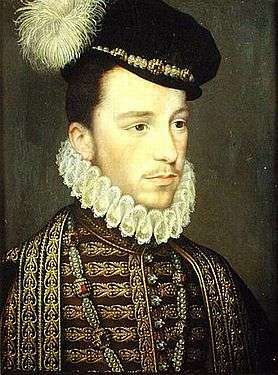 Catherine's three sons reigned in an age of almost constant civil and religious war in France. The problems facing the monarchy were complex and daunting but Catherine was able to keep the monarchy and the state institutions functioning even at a minimum level. At first, Catherine compromised and made concessions to the rebelling Protestants, or Huguenots, as they became known. She failed, however, to grasp the theological issues that drove their movement. Later she resorted, in frustration and anger, to hard-line policies against them. 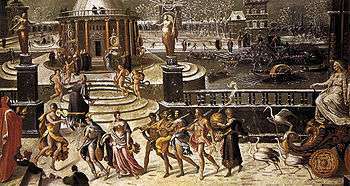 In return, she came to be blamed for the excessive persecutions carried out under her sons' rule, in particular for the St. Bartholomew's Day massacre of 1572, in which thousands of Huguenots were killed in Paris and throughout France. Some historians have excused Catherine from blame for the worst decisions of the crown, though evidence for her ruthlessness can be found in her letters. In practice, her authority was always limited by the effects of the civil wars. Her policies, therefore, may be seen as desperate measures to keep the Valois monarchy on the throne at all costs, and her patronage of the arts as an attempt to glorify a monarchy whose prestige was in steep decline. Without Catherine, it is unlikely that her sons would have remained in power. The years in which they reigned have been called "the age of Catherine de' Medici". According to Mark Strage, one of her biographers, Catherine was the most powerful woman in sixteenth-century Europe. 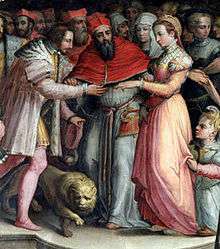 Catherine was born on 13 April 1519 in Florence, Republic of Florence, the only child of Lorenzo de' Medici, Duke of Urbino, and his wife, Madeleine de la Tour d'Auvergne, the Countess of Boulogne. 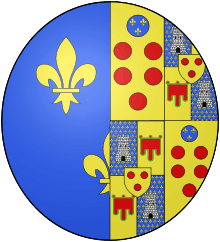 The young couple had been married the year before at Amboise as part of the alliance between King Francis I of France and Lorenzo's uncle Pope Leo X against the Holy Roman Emperor Maximilian I. According to a contemporary chronicler, when Catherine was born, her parents were "as pleased as if it had been a boy". 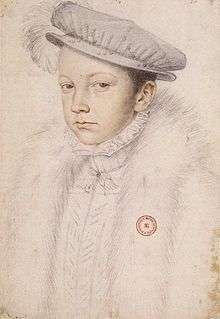 In 1536, Henry's older brother, Francis, caught a chill after a game of tennis, contracted a fever and died, leaving Henry the heir. As Dauphine, Catherine was now expected to provide a future heir to the throne. According to the court chronicler Brantôme, "many people advised the king and the Dauphin to repudiate her, since it was necessary to continue the line of France". Divorce was discussed. In desperation, Catherine tried every known trick for getting pregnant, such as placing cow dung and ground stags' antlers on her "source of life", and drinking mule's urine. On 19 January 1544, she at last gave birth to a son, named after King Francis. Catherine's new-found ability to bear children, however, failed to improve her marriage. 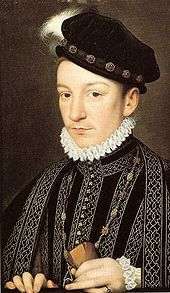 In 1538, at the age of nineteen, Henry had taken as his mistress the thirty-eight-year-old Diane de Poitiers, whom he adored for the rest of his life. Even so, he respected Catherine's status as his consort. 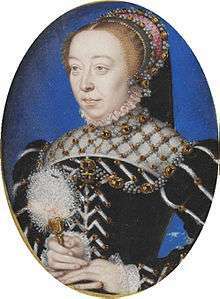 When King Francis I died on 31 March 1547, Catherine became queen consort of France. She was crowned in the basilica of Saint-Denis on 10 June 1549. 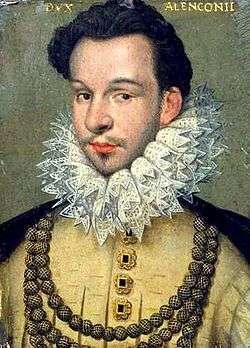 In 1566, through the ambassador to the Ottoman Empire, Guillaume de Grandchamp de Grantrie, and because of a long-standing Franco-Ottoman alliance, Charles IX of France and Catherine de Medici proposed to the Ottoman Court a plan to resettle French Huguenots and French and German Lutherans in Ottoman-controlled Moldavia, in order to create a military colony and a buffer against the Habsburg. This plan also had the added advantage of removing the Huguenots from France, but it failed to interest the Ottomans. Catherine pressed Jeanne d'Albret to attend court. Writing that she wanted to see Jeanne's children, she promised not to harm them. Jeanne replied: "Pardon me if, reading that, I want to laugh, because you want to relieve me of a fear that I've never had. I've never thought that, as they say, you eat little children". When Jeanne did come to court, Catherine pressured her hard, playing on Jeanne's hopes for her beloved son. 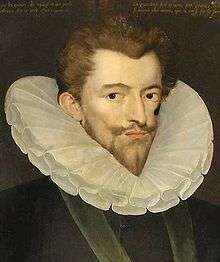 Jeanne finally agreed to the marriage between her son and Margaret, so long as Henry could remain a Huguenot. 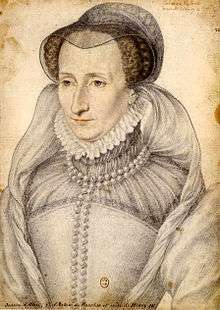 When Jeanne arrived in Paris to buy clothes for the wedding, she was taken ill and died on 9 June 1572, aged forty-three. Huguenot writers later accused Catherine of murdering her with poisoned gloves. The wedding took place on 18 August 1572 at Notre-Dame, Paris. Frieda dismisses this accusation based on the fact Catherine had nothing to gain from her death, once the marriage contract had been signed, although Frieda considered Catherine responsible for Philibert le Vayer, who was Duke of Anjou's favourite. 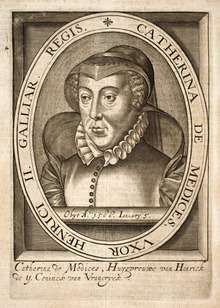 The legend that Catherine de’ Medici introduced a long list of foods, techniques and utensils from Italy to France for the first time is a myth routinely discredited by most food historians. Items whose introduction to France have been attributed to Catherine include the dinner fork, parsley, the artichoke, lettuce, broccoli, the garden pea, pasta, Parmesan, as well as the turkey and tomato of the New World. She has also received credit for introducing sauces and a variety of dishes such as duck à l’orange and deviled eggs. Barbara Ketcham Wheaton and Stephen Mennell provided the definitive arguments against these claims. 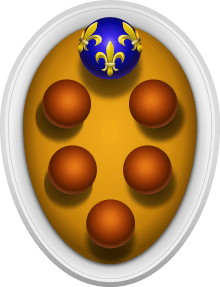 They point out that Catherine’s father-in-law, François I of France, and the flower of the French aristocracy had dined at some of Italy’s most élite tables during the king’s Italian campaigns (and that an earlier generation had done so during Charles VIII of France’s invasion of 1494); that a vast Italian entourage had visited France for the wedding of Catherine de’ Medici’s father to her French-born mother; and that she had little influence at court until her husband’s death because he was so besotted by his mistress, Diane de Poitiers. In fact, a large population of Italians — bankers, silk-weavers, philosophers, musicians, and artists, including Leonardo da Vinci— had emigrated to France to promote the burgeoning Renaissance. Nevertheless, popular culture frequently attributes Italian culinary influence and forks in France to Catherine. Catherine de Medici has been labelled a "sinister Queen… noted for her interest in the occult arts". To some, Catherine and Henry's inability to produce an heir for the first ten years of their marriage gave rise to suspicion of witchcraft. Labouvie suggested that women's power was believed to be the ability to create and sustain life, whilst witches were believed to have the opposite power; that of attacking health, life and fertility. An infertile woman, and in particular an infertile Queen, was therefore regarded as 'unnatural' and a small step from supernatural. Elizabeth I was treated with similar suspicion - she too entertained questionable characters (such as her advisor, John Dee), and produced no official heir. Essentially, however, there exists no concrete proof that either woman took part in the Occult, and it is now believed that Catherine's trouble in providing an heir was in fact due to Henry II's penile deformity. Suspicion was fuelled to some degree by her entertainment of questionable characters at court - for example, the reputed seer Nostradamus, who was rumoured to have created a talisman for Catherine, made from a mixture of metals, goat blood and human blood. Catherine also gave patronage to the Ruggeri brothers, who were renowned astrologers, but were also known for their involvement in necromancy and the black arts. 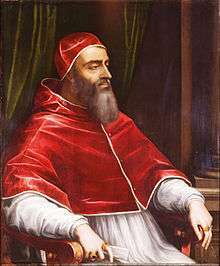 Cosimo Ruggeri, in particular, was believed to be Catherine's own "trusted necromancer, and specialist in the dark arts", although there is not a great deal of surviving documentation to tell of his life. Though some suggest that they were simply magicians, for many living in Italy at the time, the distinction between 'magician' and 'witch' was unclear. Entertaining individuals that appeared to subvert the natural religious order during the most intense period of witch hunting and a time of great religious conflict was therefore an easy way to arouse suspicion. 1 2 Knecht, Catherine de' Medici, 8. 1 2 Frieda, 53; Knecht, Catherine de' Medici, 16. 1 2 3 Pettegree, 154. ↑ Frieda, Leonie (2011). Catherine de Medici: A Biography. Hachette UK. p. 207. ISBN 9781780222608. ↑ "The Day of the Barricades", as the revolt became known, "reduced the authority and prestige of the monarchy to its lowest ebb for a century and a half." Morris, 260. 1 2 Knecht, Catherine de' Medici, 267. ↑ Alan Davidson (11 August 2014). The Oxford Companion to Food (2nd ed.). Oxford University Press. p. 232. ISBN 978-0-19-967733-7. ↑ Barbara Ketcham Wheaton (18 January 2011). Savoring the Past: The French Kitchen and Table from 1300 to 1789. Simon and Schuster. pp. 43–51. ISBN 978-1-4391-4373-5. ↑ Stephen Mennell (1996). All Manners of Food: Eating and Taste in England and France from the Middle Ages to the Present (2nd ed.). University of Illinois Press. pp. 65–66; 69–71. ISBN 978-0-252-06490-6. ↑ Diderot, Denis; le Rond d'Alembert, Jean (1754). 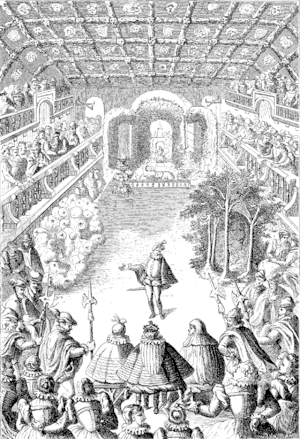 Encyclopédie, ou dictionnaire raisonné des sciences, des arts et des métiers. Paris: Briasson, David, Le Breton and Durand. p. vol. IV, p. 538. ↑ Gardner, Gerald B. The Meaning of Witchcraft. p. 91. 1 2 See Rowlands, Alison (2013). Witchcraft and Gender in Early Modern Europe. Oxford. p. 9. ↑ Gordetsky, Rabinowitz and O'Brien (2009). The "infertility" of Catherine de Medici and its influence on 16th century France (PDF). The Canadian Journal of Urology. 1 2 3 4 5 Frieda, Leonie. Catherine de Medici: A Biography. ↑ Herzig, Tamar (2013). Levack, ed. Witchcraft prosecutions in Italy. Oxford. ↑ Wiesner-Hanks, Merry (2012). Women and Gender in Early Modern Europe. Cambridge University Press. p. 253. ↑ Gardner, Gerald. The Meaning of Witchcraft. p. 91. ↑ de Givry, Grillot. Witchcraft, Magic & Alchemy. p. 121. ↑ Farley, Peter R. Where Were You Before The Tree of Life? Volume 6. p. 218. ↑ Gortner, C.W. "History's Black Widow: The Legend of Catherine de Medici". Wonders and Marvels. Retrieved 20 February 2016. 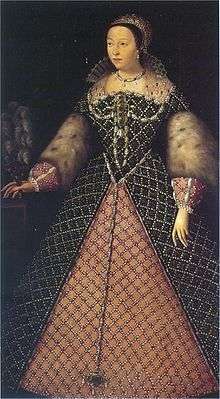 "Catharine de' Medici". Encyclopædia Britannica (11th ed.). 1911. 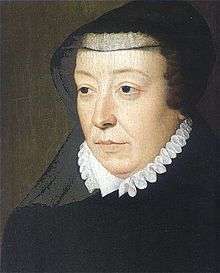 "Catharine de' Medici". New International Encyclopedia. 1905.